The artificial floating island (AFI) is an artificial wetland located on the surface of water, and nowadays applied to various water environments. In this study, we newly developed AFI combining micro-bubble and photocatalytic technologies applied to contaminated stagnant water. In this study site, Hanryucheon, is a small urban stream used for drainage of rainwater in Ilsan newcity in Republic of Korea. We respectively monitored three points (inside of AFI, outside of AFI, no AFI) for water quality and biological parameters (i.e. phytoplankton, zooplankton, benthic invertebrate, fish, and terrestrial insect) of Hanryucheon. According to this results, biological parameters showed significant different depend on existence of AFI or not. Especially, we found that AFI highly contributes to the habitat for small and juvenile fish. But, water quality improvement effect was not clear because installed AFI was only pilot test size. Nevertheless, positive biological effect of AFI was a meaningful result in that addition of meiofauna habitat around of AFI. For future studies, change of biological parameters should monitor for long-term period, and more AFI installation will need to be carefully reviewed. AFI is a complex ecological system used for water quality improvement or ecological restoration in a stagnant stream, river or lake . AFI is a floating wetland which is composed of buoyant mat and planting media and can cope with various water level changes [1,2]. Prior AFI is widely used in stagnant waters because it not only has the ability to purify water by vegetation but also provides a space where diverse organisms can live . In recent years, not only general water purification function utilizing AFI but also convergence technology (e.g. micro-bubbles, photocatalytic technology, sunlight, etc.) aimed at removing harmful blue green algae. Above all, one of the greatest advantages of AFI is that it creates an independent ecological space by vegetation mat on the water surface without soil. The biofilms formed in the roots of the vegetation connected to the host and the water layer provide excellent habitat for phytoplankton, zooplankton, benthic invertebrate, and fish. In addition, vegetation communities of the AFI are the interface of water-terrestrial and serve as a corridor for organisms. 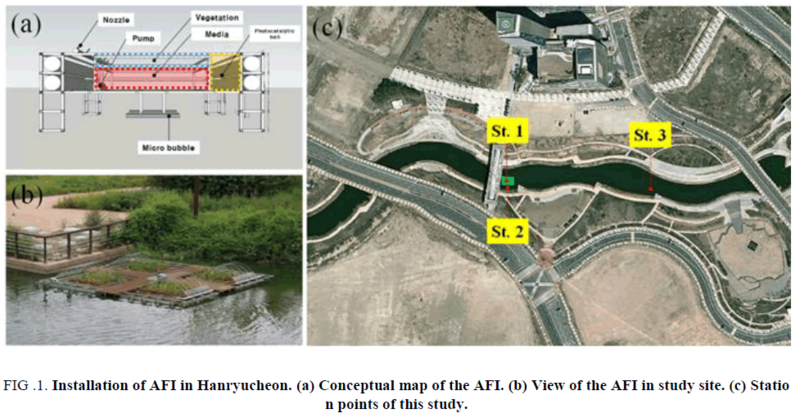 In this study, AFI, which was developed in Hanryucheon that a small drainage stream located in Ilsan new city, Republic of Korea, was installed to conduct biological monitoring. Also, we tried to analyze the potential possibility of ecological restoration effect of AFI through three point comparison. Figure 1: Installation of AFI in Hanryucheon. (a) Conceptual map of the AFI. (b) View of the AFI in study site. (c) Station points of this study. This study was divided into experimental and control groups based on AFI installed in Hanryucheon. Phytoplankton, zooplankton, benthic invertebrate, fish, and the distribution of terrestrial insect was measured at the same time. The experimental and the control groups were classified as a TABLE 1 reflecting the characteristics of the field. This survey was conducted in September 2015. Table 1: Station point and description of various ecological parameters. Water quality analysis was performed according to the multi-measuring device (water temperature, DO, DO saturation, pH, electric conductivity, turbidity) and the standard method (COD, TN, TP, Chl-a) . Phytoplankton was collected using net (mesh size 20 μm), fixed with Lugol solution and identified under optical microscope (Nikon Eclipse, Japan) using S-R chamber. The zooplankton was fixed with formalin (final concentration 5%) using net (mesh size 150 μm) and identified under optical microscope (Nikon Eclipse, Japan) using S-R chamber. Fish were collected by CPUE method using scoop net (mesh size 4 × 4 mm) and cast net (mesh size 7 × 7 mm). The collected fish were fixed to 10% formalin and transported to the laboratory, and were identified. Benthic invertebrate and fish were evaluated by cluster analysis. The dominant species was selected by proportion of populations in the same area, and the dominant index was calculated by the Naughton's dominance index method. The biodiversity followed Shannon-Wiener Function, and evenness was based on Pielou  and the richness was calculated by Margalef  and Ludwig et al. .
where DI is dominance index, N is total population, ni is individual of the i-th species, H' is biodiversity, S is total species, Pi is rate of the i-th individual, E' is evenness, R' is richness. The basic water environmental parameters measured at the three points, and result data showed in TABLE 2. First of all, water quality result of the St. 1 to St. 3 showed no significant difference in the most water quality parameters. However, the most significant factor, Chl-a in St. 1 represent relatively lower in 33.3% and 28.3 than St. 2 and St. 2. Table 2: Water quality results of study site. The range of water temperature is 17.4~17.7°C, it is similar all sampling stations. DO and pH showed high level conditions at all points. Measured DO range showed 13.4~16.5 mg L-1, and all points were found to be supersaturated. pH range showed 9.9~10.1 mg L-1, indicating week alkalinity. In general, algae (phytoplankton and periphyton) produces by-product oxygen and increases the pH level through daytime by photosynthesis . Considering the high DO, pH and Chl-a value in the study area, all points are considered to be due to photosynthesis of algae. But, the reason why the St. 1 is relatively low value of Chl-a is considered to be due to shading of the AFI. The electrical conductivity (EC) is higher than that of ordinary Korean general rivers (<200 μS cm-1) at all three points, and it is considered necessary to manage the external pollutions. Turbidity was generally high at all points. The inside of the study points is usually stagnant, but there is a characteristic that the soil and pollutants generated from the outside frequently inflow. Organic matters in water showed relatively lower St. 1 than St. 2 and St. 3. COD, TN, and TP were 5.5~38.1 % lower in St.
1. These results means that the organic matter is decayed or settled near the AFI that relatively stagnant more. In addition, relatively low Chl-a level in St. 1, suggesting that phytoplankton may be an obstacle to growth for nutrients supply in the AFI even in a nutritious waterbody (TABLE 2). We compared and analyzed the abundance of phytoplankton and zooplankton in St. 1 and St. 3. At first, phytoplankton was identified in 20 genera and 27 species throughout the study site (TABLE 3). Of these, St. 1 were 26 species of 19 genera, St. 3 were 22 species of 16 genera were identified. Dominant species were Microcystis sp., a blue green algae that flourished when the water body was eutrophicated. Despite of the abundance of species diversity was higher in St. 1 than St. 3, the population by standing crops in St. 1 was 7.1 % lower. It was expected that AFI would have the potential to reduce the phytoplankton abundance. In general, AFI reported to be able to inhibit the potential growth of phytoplankton due to the removal of nutrients (nitrogen, phosphorous) by vegetation and the shading effect of floating mat . Table 3: Individuals and species results of phytoplankton and zooplankton in study site. Especially, nutrients removal by vegetation mainly occurs in submerged roots. The roots of the aquatic plants and the biofilms attached to them are in competition with the growth of phytoplankton. Under the root zone is a layer of decomposed peat, and the performance of the algal growth inhibition for nutrition competition is depended by depth of submerged roots and water column. In the submerged roots, biofilms are formed, which further accelerates nutrient competition with phytoplankton. Eventually, these interactions may indicate a decrease in nutrients and phytoplankton biomass in the AFI water column zone . Therefore to is considered that St. 1 (AFI) is effective for inhibition of phytoplankton than St. 3. Second, total 27 species of zooplankton were identified at all survey sites. Among them, there were 22 species in the experimental group and 21 species in the control group (TABLE 3). However, total individuals showed significant low in St. 1 (1,097 ind L-1) than St. 3 (2,844 ind L-1). In general, AFI is known to have the ability to increase the abundance of zooplankton . But before that, AFI should be aware that it is a mutual space in which various organisms live . As a result of the this field survey, we found that there are many small and juvenile fish under AFI, and the reason for low density of zooplankton in St. 1 is considered to be closely related to the increase in the predation pressure of fish that are densely populated in AFI. The composition of the zooplankton, Rotifera (Brachionus angularis) and Protozoa (Glaucoma sp.) showed a relatively high proportion of total population. They are dominant species in eutrophicated freshwater and it can be a good food for fish . We compared and analyzed the abundance of benthic macroinvertebrates in St. 1, St. 2 and St. 3. Benthic macroinvertebrates, 504 individuals of 13 species were identified in study area. Most of the observed benthic macroinvertebrates were stagnant water preference species. The dominant species were Anopheles sp. in St. 1, Chironomidae sp. in St. 2 and 3, which represents generally lentic conditions of Hanryucheon. Community analysis results of the benthic macroinvertebrates represent in TABLE 4. DI value, dominance index, ranged from 0.70~0.84 that the characteristics of lentic system habitats dominated by specific species and few species were well identified. H' value, the biodiversity index, and R' value, the richness index, were the highest value for 1.47 and 1.51 in St. 2, respectively. The richness index, which is an index representing the number of individuals, St. 1 is lower than St. 2, St. 3. However, St. 1 showed high biodiversity and evenness index, and it was concluded that the complexity of cluster and uniformity of species composition were good. Table 4: Cluster analysis results of benthic macro invertebrate. Spatial comparison analysis of this study showed that there was a clear difference from other sites, because this facility was installed on the surface water where the benthic invertebrate habitat could be restricted. Nonetheless, the high diversity of species suggests that AFI is an independent space that provides good habitats for a variety of species. We compared and analyzed the abundance of fish in St. 2 and St. 3. Fish was captured 382 individuals (four species), which prefer in lentic species. The highest population in St. 2 near AFI, and dominant species (96.7 %) was Pseudorasbora parva. Also, total length of the fish found mainly in AFI was 7.0~31.5% smaller than outside of AFI. These results indicate that AFI is a suitable environment for small size (or juvenile) of lentic fish for habitat. In the underwater layer of the AFI, the roots of the aquatic plants and the biofilms are serve as a complicated structure for fish to avoid predators, and there is abundance of fish’s favorite food, for example phytoplankton and zooplankton. Therefore, small or juvenile fish are likely to utilize the space below the AFI as a main habitat or shelter . Cluster analysis result in St. 2 was simple because of the dominant result of juvenile fish. In other word, based on these results, it was concluded that the fish culture showed a monotonous and closed pattern, and so, it is necessary to continuously ecological management. The index of dominance index is a measure of the degree of dominance of a species and has a range of 0 to 1, and the closer to 1, the higher the proportion of dominant species. In the St. 2, the dominant index was 0.992, and the St. 3 was relatively uniform. The biodiversity index means the degree of species abundance and relative balance of populations and indicates the complexity of the community. In this study, biodiversity index showed that St. 3 was higher than St. 2. In addition, St. 3 was higher than St. 2 in both evenness index and richness index. This means that the overall species composition in St. 3 is relatively uniform and the environment is good. However, it is necessary to note that all of these results are the due to extreme dominance of Pseudorasbora parva in AFI (TABLE 5, 6). Table 5: Fish fauna of this study. Table 6: Cluster analysis results of fish. We compared and analyzed the abundance of terrestrial insect in St. 2 and St. 3. Terrestrial insects were identified in 116 individuals (26 species). Collected species were identified as common species mainly in urban parks in Republic of Korea. Population showed 18.8 % high in St. 2 than St. 3, and dominant species was Ischnura aisatica (15.5%). However, land insects were also monotonous as a whole due to the lack of sufficient habitat. The habitat of terrestrial insects may be temporarily damaged, because weeding work after autumn in this area. In addition, habitats of terrestrial insects may vary not only in vegetation composition but also in the shape of the waterfront. Therefore, if AFI is introduced into monotonous or damaged habitats, it will be possible to secure more habitats of terrestrial insects. In this study, water quality and ecological monitoring results were compared and analyzed at each site by installing AFI on Hanryucheon which is a small rainwater drainage stream. As a result, there were differences in species and individuals of the fauna like a phytoplankton, zooplankton, benthic invertebrate, fish, and terrestrial insects. It is considered that the increase of the microhabitat of meiofauna by AFI. However, due to the small size of the AFI, the effects of water quality improvement and ecological restoration were not significant. But, according to previous studies, AFI can apply to various environment (stormwater pond, mining or refinery plant wastewater, meat processing plants poultry or livestock effluent, lakes, rivers, water supply reservoirs, agriculture and aquaculture environment etc. ), AFI studies tested by mesocosm or pilot scales showed for removing various water pollutions (organic matter, suspended solids, nutrients, metals etc.). Therefore, it is necessary to increase the installation scale of AFI and to carry out long-term monitoring of the variation of organisms in order to obtain clear results of ecological restoration effect according to AFI installation in the future research. This subject was supported by “Development of algae management using stream structures in the stream” (code 18AWMP-B112149-04) and “River Restoration Program for Developing Coexistence between Nature and Human (Green River) (12technological innovationC02)” funded by MOLIT (Ministry of Land, Infrastructure and Transport). Yeh N, Yeh P, Chang YH. Artificial floating islands for environmental improvement. Renewable and Sustainable Energy Reviews. 2015;47:616-22. De Stefani G, Tocchetto D, Salvato M, et al. Performance of a floating treatment wetland for in-stream water amelioration in NE Italy. Hydrobiologia. 2011;674(1):157-67. Kato Y, Takemon Y, Hori M. Invertebrate assemblages in relation to habitat types on a floating mat in Mizorogaike Pond, Kyoto, Japan. Limnology. 2009;10(3):167. Yoon Y, Lim HM, Kim WJ, et al. Development and application of multi-functional floating wetland island for improving water quality. Ecology and Resilient Infrastructure, 2016;3(4):221-230. Pielou EC. Ecological diversity. New York. 1976. Margalef R. Information theory in biology. General Systems Yearbook. 1958;3:36-71. Ludwig JA, Quartet L, Reynolds JF. Statistical ecology: A primer in methods and computing.1988. Horne AJ, Goldman CR Limnology. Second edition, Singapore : McGraw-Hill international editions;1994. Fontanarrosa MS, Chaparro G, de Tezanos Pinto P et al. Zooplankton response to shading effects of free-floating plants in shallow warm temperate lakes: a field mesocosm experiment. Hydrobiologia. 2010;646(1):231-42. Lubnow F. Using floating wetland islands to reduce nutrient concentrations in lake ecosystems. National Wetlands Newsletter.2014;36(6):14-17. Dumont HJ, Sarma SS. Demography and population growth of Asplanchna girodi (Rotifera) as a function of prey (Anuraeopsis fissa density.Hydrobiologia.1995;306(2):97-107. Zhu L, Li Z, Ketola T. Biomass accumulations and nutrient uptake of plants cultivated on artificial floating beds in China's rural area. Ecological Engineering. 2011;37(10):1460-6.